This is the listing for a Set of 2 Barn Quilts in mixed sizes. One 2' quilt and one 3' quilt, both with thick frames. Any two patterns in coordinating colors, or completely different! Choose your own! These hand-painted Barn Quilts are very rustic and will look awesome hanging outside on a house or garage or used as inside wall decor as well! Please note that all of my quilts have a painted black border IN ADDITION to the black frame. It's my signature look. The width of the painted border is determined by the size of the quilt and the pattern of the quilt, so there may be a slight difference in the look depending on the size of quilt in the photo. Also note that NOT ALL of the quilts pictured have the exact frame style for that listing. Refer to the last picture on the listing for a close-up of the frame and black border. All of my quilts are hand-painted on 1/2" plywood, using premium Exterior paints with primer, then are distressed and stained to achieve that aged look. They are finished with 2 coats of exterior Varathane. These quilts both have the thick frame with a routed groove that encloses the edges of the quilt. (See last photo for close-up example of frame style) The finished size of the 3' quilt is roughly 36" X 36", the 2' quilt is roughly 26" X 26". A Set of 2 quilts in the 2' size as well as a 3' Set are available in separate listings. Many other color combinations are available upon special request. Feel free to contact me with questions on colors! I'll be happy to help! Also note, there is an additional charge for exact match colors. PLEASE NOTE that all of my Barn Quilts are custom painted at the time of order, and may take 3-6 weeks for delivery. (Many times it will be finished sooner, however orders are processed and painted in the order they were received) Occasionally, I have items available for immediate shipment, however, that will be noted at the top of the listing. MULTIPLE PURCHASES.... Please message me BEFORE making a purchase of multiple items as I may be able to combine on shipping. Thanks for shopping with Crow Corner Primitives on ETSY!!! Check out our page on Facebook, too! My wife loved it. Gave her a gift certificate for Christmas. Great seller to work with and great product! Highly recommend! I have been looking for a barn quilt for awhile. I found Crowcorner Primitives and the owner Hollie. Hollie was amazing to work with. I twiked one of her designs to get the colors that I wanted. Hollie did an amazing job on the quilt! I absolutely love it!! The first quilt was damaged in shipping and Hollie made a replacement very quickly and happy to do so!! Love love my quilt hanging above my garage. Beautiful work. I love the barn quilts on my log house. I chose the patterns and colors and she did exactly what I wanted. Payment with credit cards accepted through Direct Checkout, and also via Pay Pal at crowcornerprimitives@gmail.com. Check or Money Order can also be mailed to Crow Corner Primitives, N5831 670th St., Ellsworth, WI. 54011. Unless otherwise noted, all items are custom made after order is received, please allow 4-6 weeks for delivery. Keep that in mind when ordering for Wedding and Anniversary signs! Also note that there will be a cut-off date for Christmas orders. Purchases are generally shipped via USPS for most items, larger barn quilts via Fed Ex. Feel free to contact me if you have any questions regarding color combination, order turn-around and any other concerns. Please note that items are highly distressed and stained, so there may be slight differences in color, etc... That's just part of the character!! Please message me when placing order if you don't want item distressed or stained. 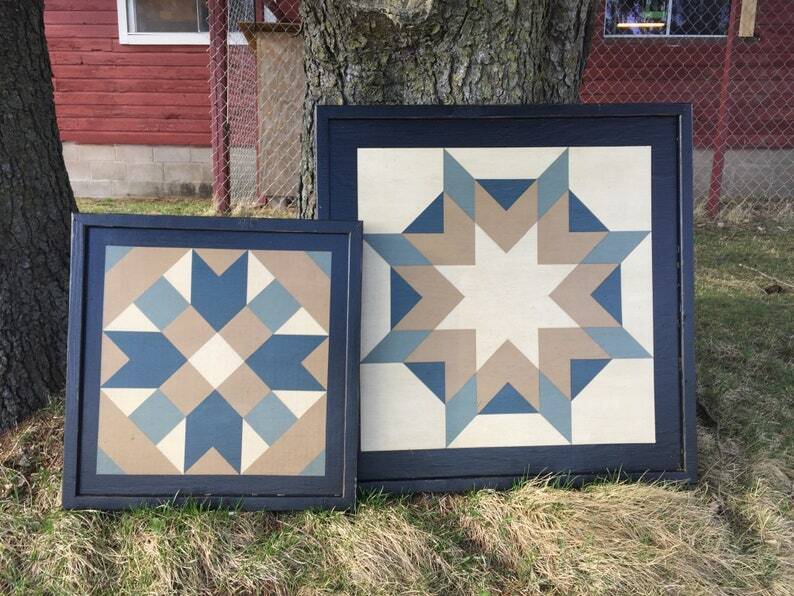 Crow Corner Primitives would LOVE to see pics of your barn quilts in their NEW HOMES! Pics can be emailed to me at crowcornerprimitives@gmail.com I'd love to share them on my Facebook Page for Crow Corner Primitives in Album named "Barn Quilts in their New Homes! Thanks!! !